I adapted this recipe from one in Barbara Tropp’s China Moon Cookbook (one of my all-time faves!). Tropp adapted it from a recipe by Mary Sue Milliken and Susan Feniger (there is a pickled tomato recipe in their City Cuisine cookbook). My recipe combines elements from both, adapted based on what I had in my kitchen. I love Tropp’s addition of Chinese fermented black beans in the dish, but they can be hard to find, so feel free to leave them out. Toss the tomatoes and scallions together in a large bowl. In a small saucepan, combine the vinegar, sugar, salt, ginger, and lemongrass and heat over medium heat, stirring often, until the sugar is dissolved. Remove from the heat. In a separate saucepan, combine the vegetable oil, chiles, sesame oil, fermented black beans (if using), garlic, turmeric, and pepper. Heat over medium heat until the surface shimmers and the oil is very hot. REmove from the heat and let cool for 5 minutes. 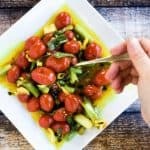 Combine the oil and vinegar mixtures and immediately pour the mixture over the tomatoes and scallions in the bowl. Stir to mix well. Store the tomatoes, scallions, and the liquid in glass jars in the refrigerator. Chill for at least 6 hours before serving. They’ll keep in a sealed container in the refrigerator for up to 2 weeks.